AcetoneISO is an application that uses Fuse (Filesystem in Userspace) in order to mount ISO, NRG, BIN, MDF, IMG and various other disk images. By default, AcetoneISO creates empty directories in $HOME/virtual_drives/, in which it mounts the images. You can browse these directories to access the contents of any mounted disk image. AcetoneISO also uses mencoder (which will have to be installed manually, since it's only a 'suggest' dependency - at least in Ubuntu) in order to rip DVDs to Xvid, download YouTube videos, or convert FLV videos to AVI, or extract audio from a video file, for which you will have to manually install ffmpeg. I noticed that AcetoneISO crashes with a segmentation fault when trying to use one of the options 'Erase CD-RW' or 'Erase DVD+RW' and there is no disk in the drive. 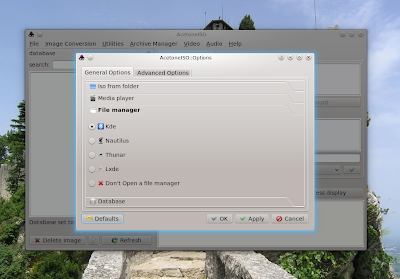 The configuration dialogue allows you to set up a disk image database, select which video player to use for playing DVD images or enable and disable the system tray. Except for the few bugs (and the occasional crashes), AcetoneISO may be a good choice for those who like GUI more than the command line.